This was my home from Oct.22-Nov.6….It’s the M/V Sea Spirit. It’s 297′ long and 50′ wide. 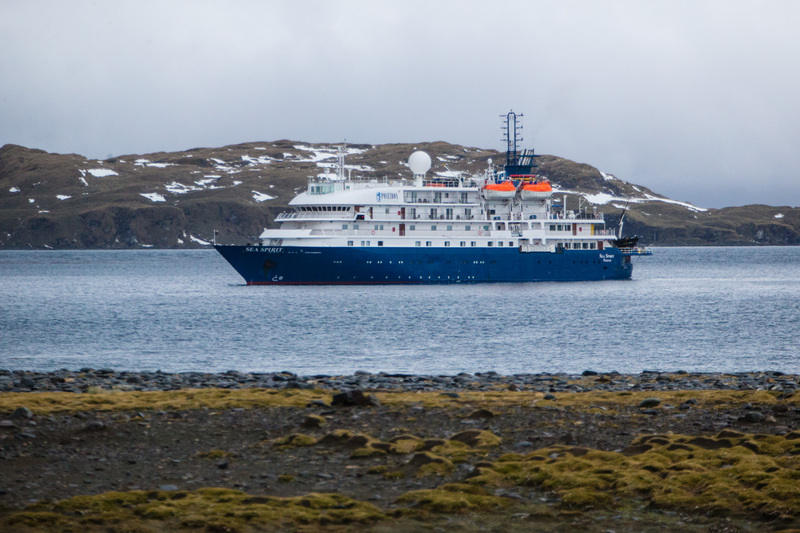 There were 100 passengers, 21 expedition staff from Cheeseman’s Ecology Tours and 68 crew members from the ship’s owner, Poseidon Expeditions. It’s considered an all-suite luxury ship. Unlike Caribbean cruises, there was no shuffleboard, climbing walls, midnight buffets dancing penguins or a comic. There was no swimming pool although there was a hot tub that may have been used by 10-15 people. There was a bar and afternoon tea with appetizers was often served between 4-6:30. There was also a small library with mainly books on Antarctica and the southern ocean. When dinner was over, most everyone hit the sack to be ready for the 4:30am wake up call many mornings. We had a couple of late wake up calls at 5:30 while at a landing and the luxury of 8am while at sea. 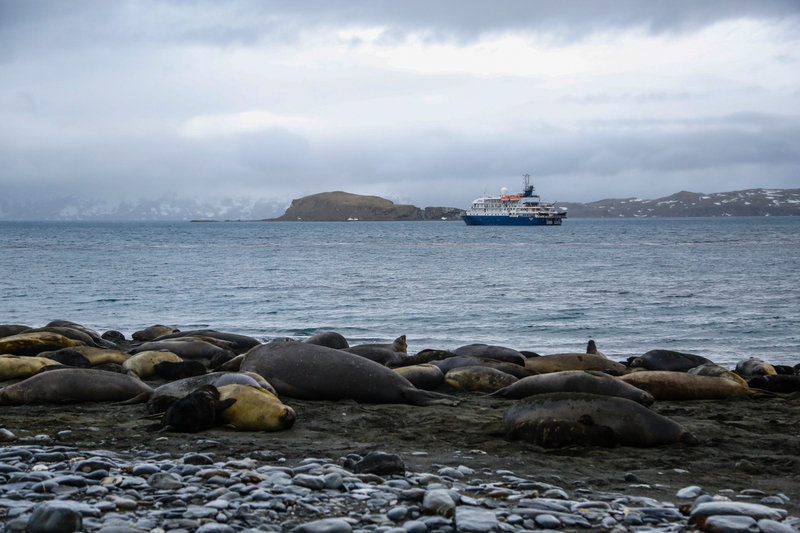 Here’s an image of the ship with elephant seals and fur seals on the beach. I shared a room with two others…Angiolo (pronounced Angelo) from San Francisco and David from New Zealand. David had lost his wife to cancer in March and had decided to take this trip to clear his head. Both were very great roommates. There were passengers from Great Britain, Canada, New Zealand, Australia, Brazil, Switzerland, Hong Kong and, of course, most of us were from the US. Our cabin contained two beds slightly narrower than a twin bed and a sofa sleeper. We also had a large window. 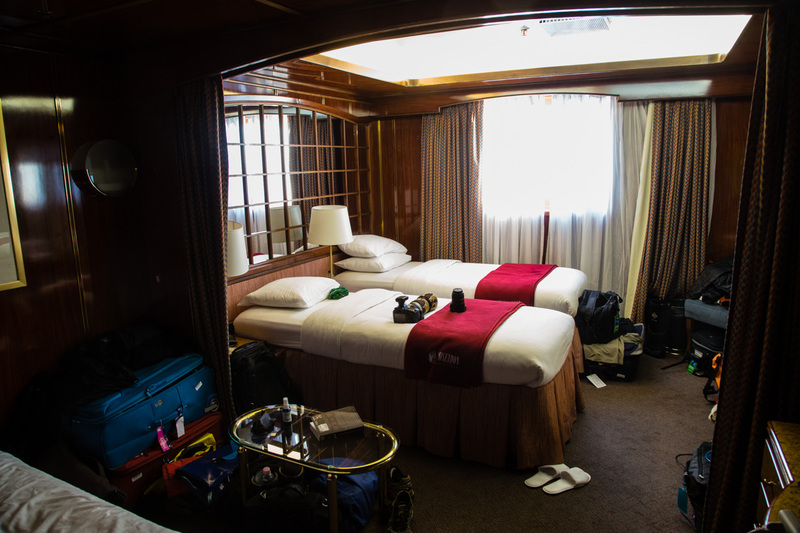 At night, the ship was blacked out so that birds wouldn’t fly into the lighted windows. It was quite comfortable. A twin room had the same twin bed setup and the sofa was setup as a sitting room. There were a couple of cabins on the 5th and 6th deck with balconies. We had a lounge set up for lectures with 6 large screen tv’s across the front and swivel chairs screwed to the floor. Meals were served in the dining room with seating for everyone at once. Breakfast and lunch were buffet style and dinner was a sit down dinner. Breakfast consisted of several dry cereals, bacon, scrambled eggs, ham, sausage, oatmeal, six different juice choices, assorted fruits, bread and sweet rolls, coffee and tea plus you could order the chef’s specials from the menu. Lunch also offered multiple choices of main courses, sides, salads and two desserts. Dinner was ordered from a daily menu. There was always four appetizers/salad choices, four main course choices including veggies and two desserts. There were about 8 waiters at every meal. The guy that served us breakfast at 5am also served us dinner at 8pm. They became our friends. 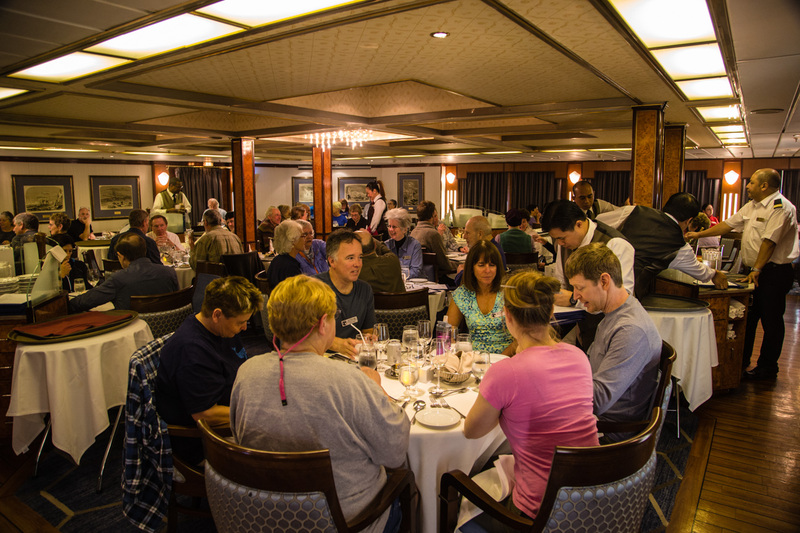 Depending on our daily wake-up calls, which were often 4:30am – 5:30am, breakfast would be served from as early as 5am-6am to as late as 8am-9am when at sea. 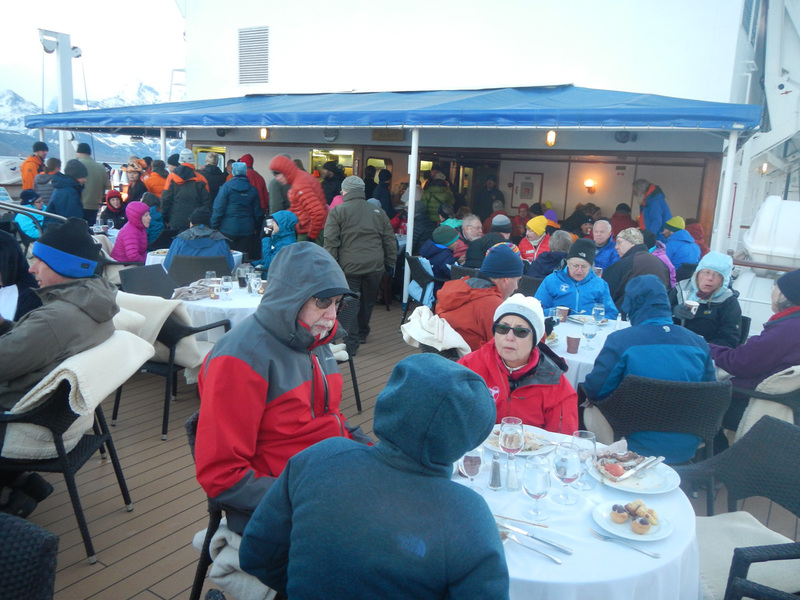 Dinner was never earlier than 7pm and often 8pm after a full day on shore. On two occasions we had packed lunches to take ashore while in the Falklands toward the end of our trip. You always had the choice of returning to the ship for lunch and going back ashore if that worked for you. 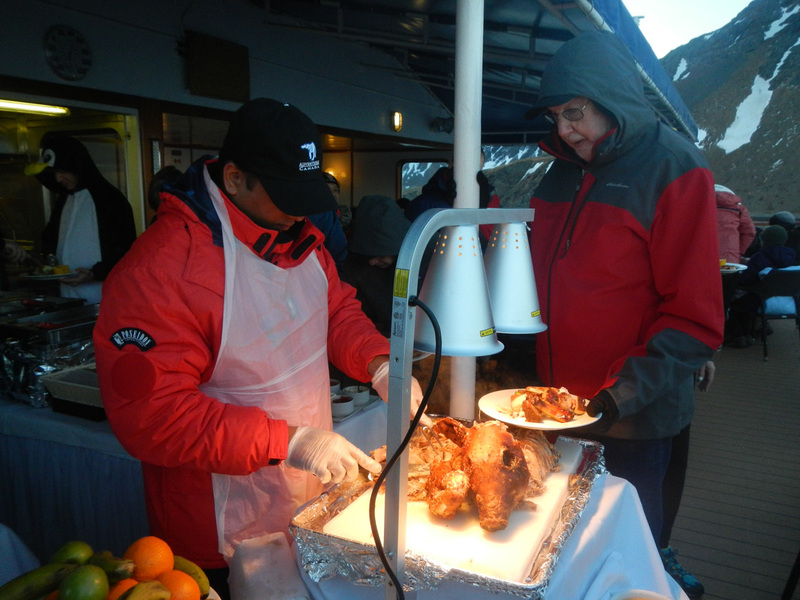 The food was excellent with fish, steaks, lamb, pastas, pork and casseroles being offered at different times. There was always a good assortment. 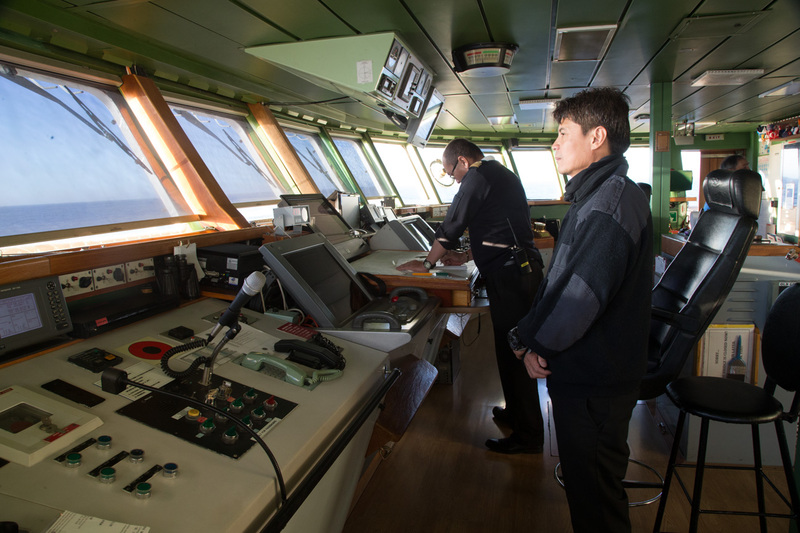 There was also an open bridge policy except when navigating into a tight situation. There was a strict no smoking policy on the ship except on the bridge and there only the cigarette-addicted captain was allowed to smoke. As I stated all meals where served in the dining room except for our BBQ night. 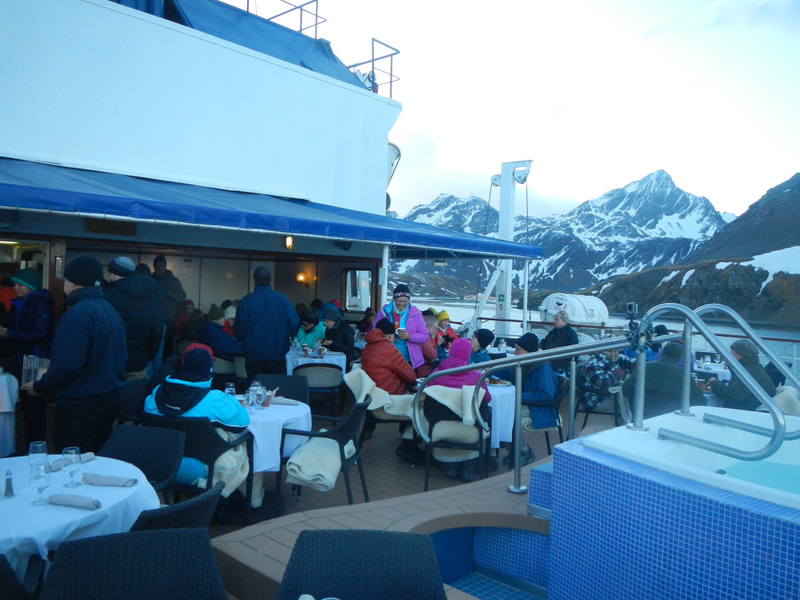 The food was good but it was served outdoors on the 5th deck. As you can see, it was chilly…. Fun idea but not my favorite location. I would have preferred to eat without having to wear gloves! Everyone ate in a hurry. South Georgia Island was a whaling station. In the mid-1800’s whaling was done on factory ships where whales where slaughtered, blubber melted and meat taken. Eventually, the whaling moved ashore to whaling stations. 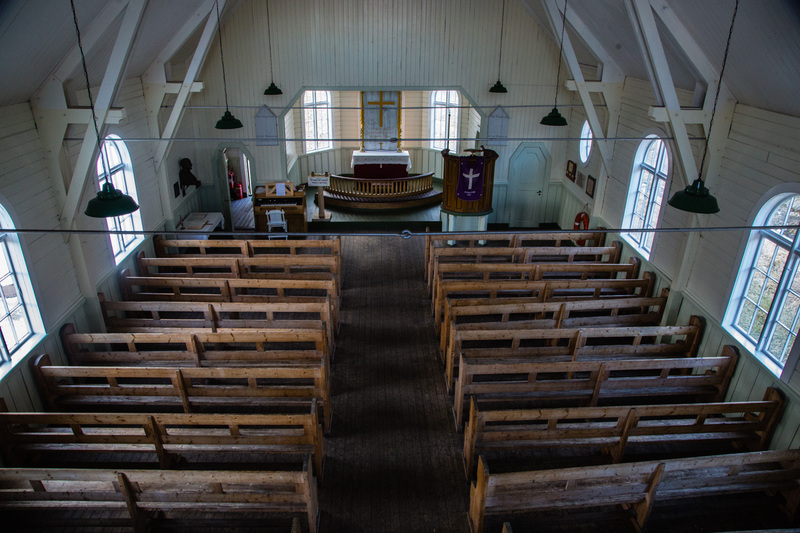 We visited two…Stromness…which had restricted access due to deteriorating buildings and Grytviken (grit-vic-un). This is Stromness. 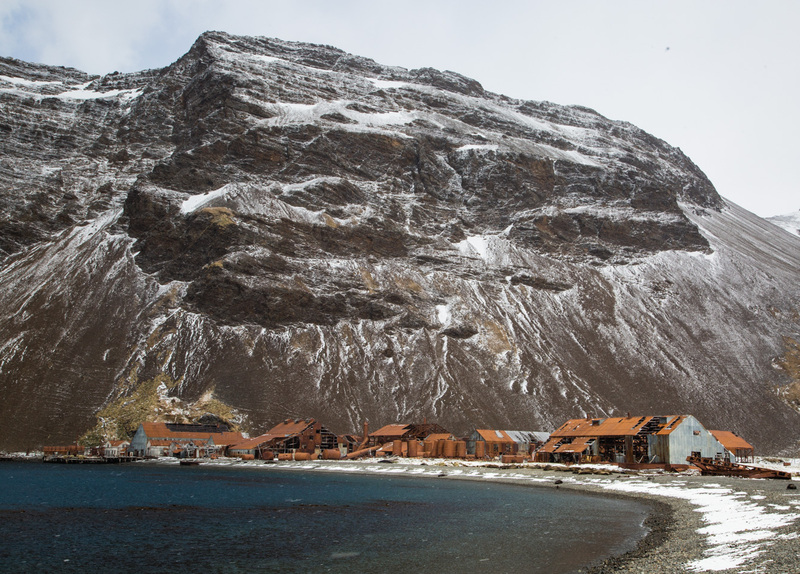 The main whaling station is Grytviken. This is the only active location in South Georgia. There is a British research station here. There are no permanent residents. There are three government officials at the research station including the lady who runs the library and her husband who is the customs officer. South Georgia is a administrative protectorate, I think is the term, of Great Britain. There is a governor on the Falklands who overseas South Georgia. 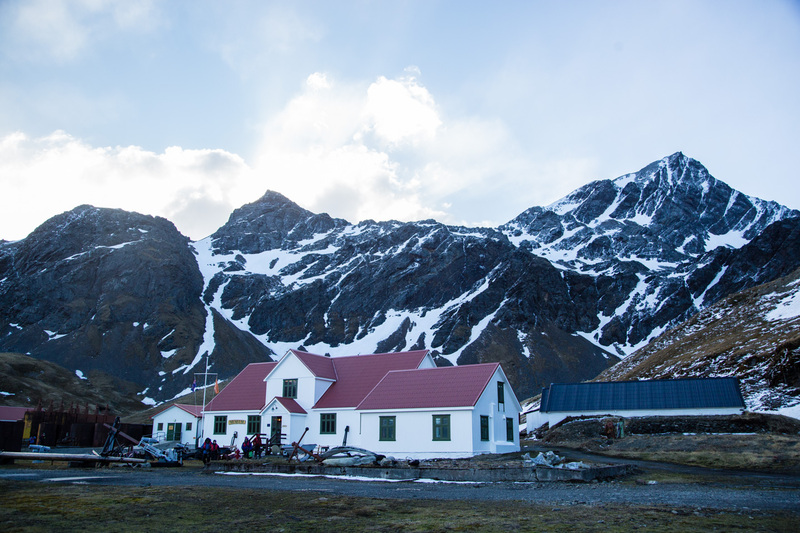 The research station has 7 people there during the winter and it swells to about 30 during the summer months. We were the first ship of the season. During their summer many other ships come here. 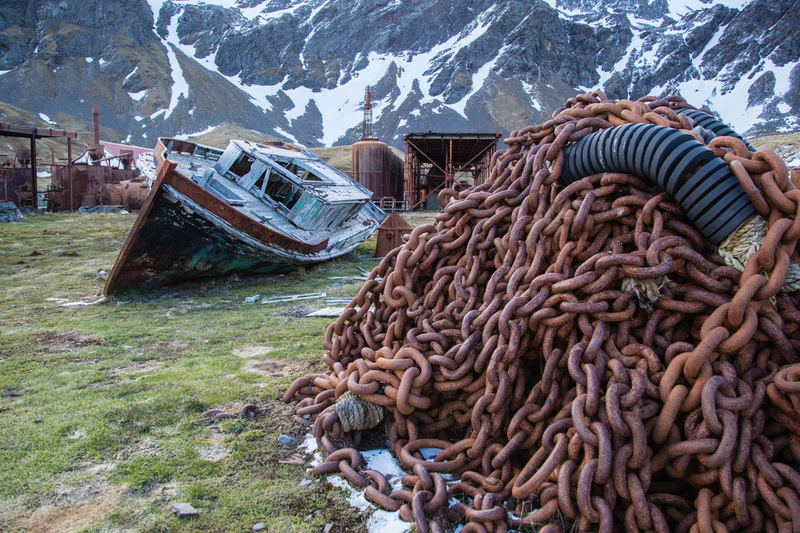 There are also some rusting whalers and tanks used for storing blubber. 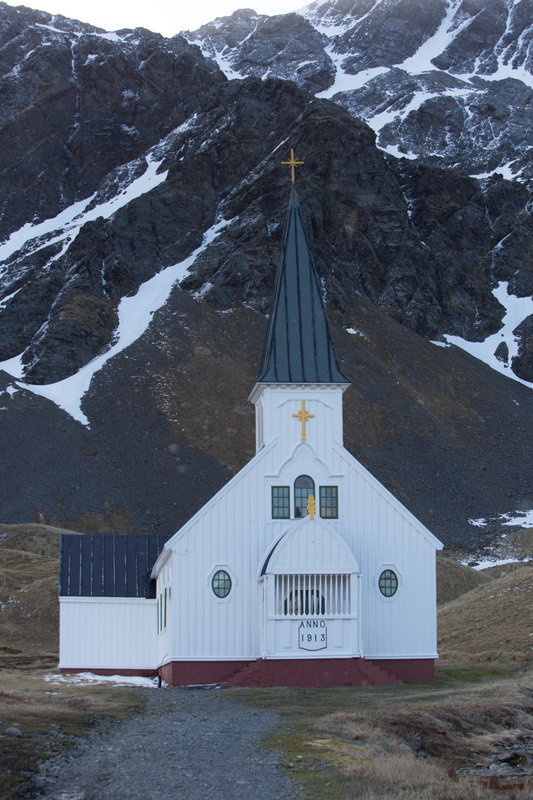 This is also were the British explorer, Sir Ernest Shackleton, and two of his crew are buried. 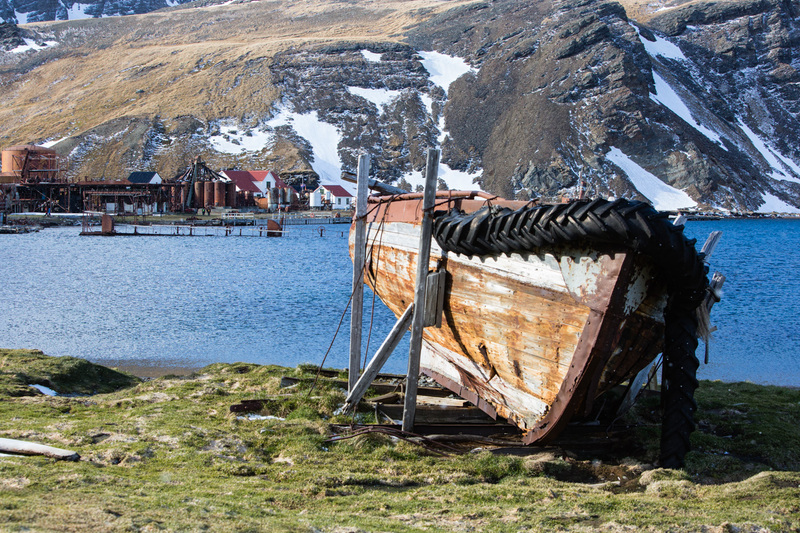 Shackleton and his crew of 27 departed Great Britain in 1914 on a specially-built wooded boat headed for Antarctica. Their plans were to make a land crossing of the continent. They became locked in ice in the Weddell Sea and their boat, the Endurance, was eventually crushed. After months locked in the ice the men got onto an ice flow with three wooded lifeboats and floated for months until spring when the ice started to melt and they were forced to take to their boats. Eventually, after more months they made it to Elephant Island. Two of the boats were turned over and became shelters. 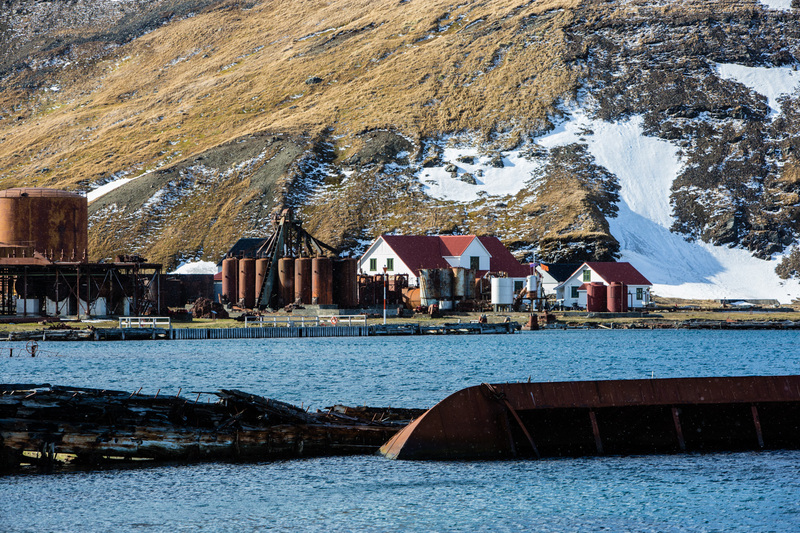 Again, months went by and Shackleton and five of his crew departed to look for rescuers. They sailed to South Georgia Island but landed on the opposite side of the island from where the whaling stations were located. 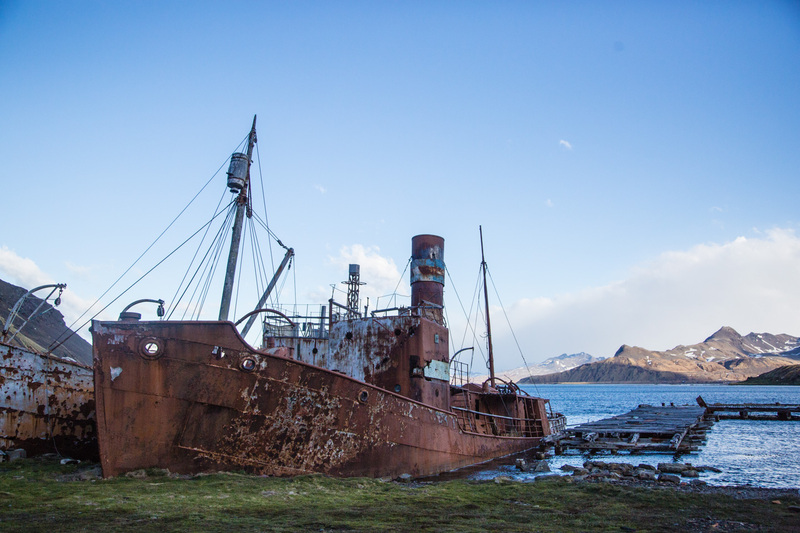 Shackleton and two others decided to hike over the mountains and left the other three with the boat. They eventually descended into Stromness much to the surprise of the whalers there. They organized a rescue party to pick up the three left behind on the other side of the island and to go back for the others still on Elephant Island about 700 miles away. It took four months and four attempts before he able to rescue them. All of his 27 crew members survived. They were rescued in 1916 two years after leaving Great Britain. They had been living on seals, sea birds and anything else they could find. Shackleton returned to Great Britain and was knighted. He then set about organizing another trip to the southern ocean. He died of a heart attack on board the ship in 1922 on his way back to Antarctica. His wife wanted him buried on South Georgia. Later, two other shipmates were buried beside him. 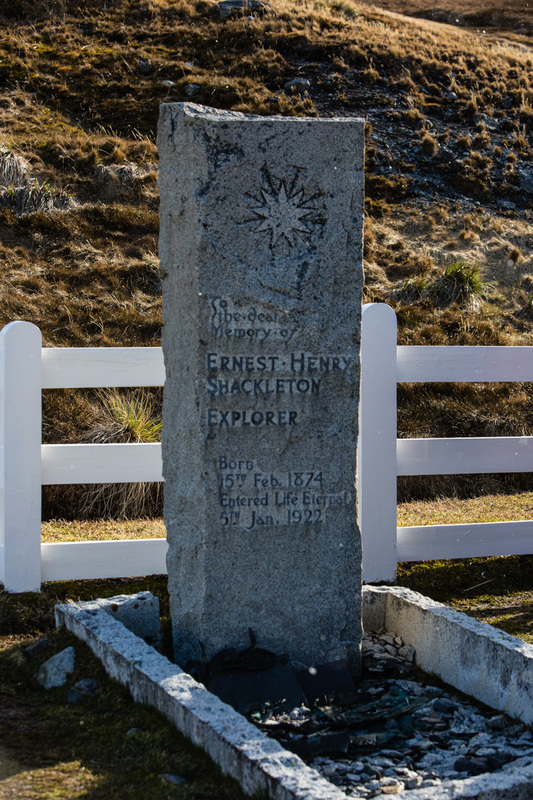 When our group landed at Grytviken we gathered for a toast and group picture at Shackleton’s grave. This brief description doesn’t do the story justice. You can read about it in the book, Endurance, and supplied to us by our tour company prior to the trip. It is a very interesting story. The author is Alfred Lansing. I believe the original book was published in 1986 but the copy I got was published in 2014. Whaling continued at South Georgia until 1965. Now, here’s a taste of what’s to come. This is 9-image panorama I shot from a zodiac at St. Andrews Bay. Please click on it for a larger, expanded view. 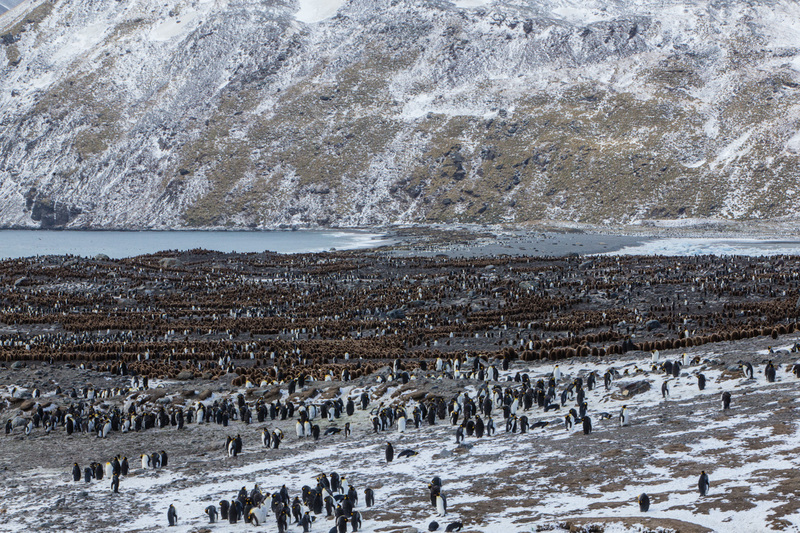 There are hundreds of thousands of penguins. 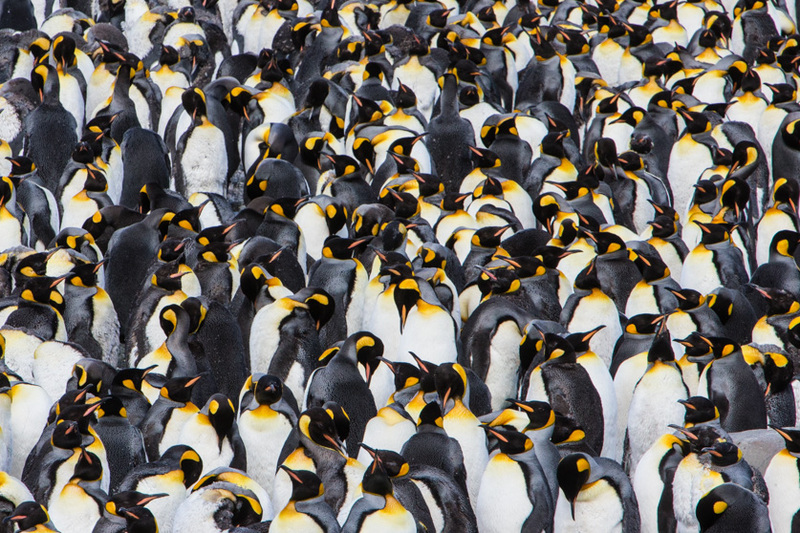 These are king penguins. This is a view from a ridge of king penguins and their young. The brown groups are the youngsters, called oakum boys. In a couple of months, there won’t be any space between any of these birds….yes, penguins are birds. The area will be wall to wall penguins. I love your adventurous spirit!!! !